The art of healing is not a “one size fits all” process. Its modalities are as diverse as the people it serves. The kaleidoscope of human suffering is too complex to overlay a singular paradigm and expect the outcome to treat the whole person. The rich stories of peoples’ lives require an equally rich and developed treatment plan rooted in an integrated philosophy – a philosophy that goes beyond mind-body compartmentalization to a mind-body unity. Medicine, psychology and spiritual practices like meditation and mindfulness are essential dialogue partners in the art of healing. Together they create a holistic approach that values, understands and implements the interdependency of physiology, psychology and spirituality. Recognizing the multi-dimensions of care, yoga and sound therapy are one of the many healing modalities that can be utilized to assist individuals/groups along their journey of wholeness. As a four-thousand-year-old practice, yoga combines breath, body-movement and consciousness to release physical and mental tension. By pairing physical shapes with diaphragmatic breathing and concentrated awareness, one moves away from a fight or flight posture, to a rest and digest posture which decreases stress and anxiety, calming the mind, lowering heart rate and blood pressure, and strengthening the immune system. As ancient as yoga, the use of sound has also been employed to aid in the healing of physical and mental dis-ease. 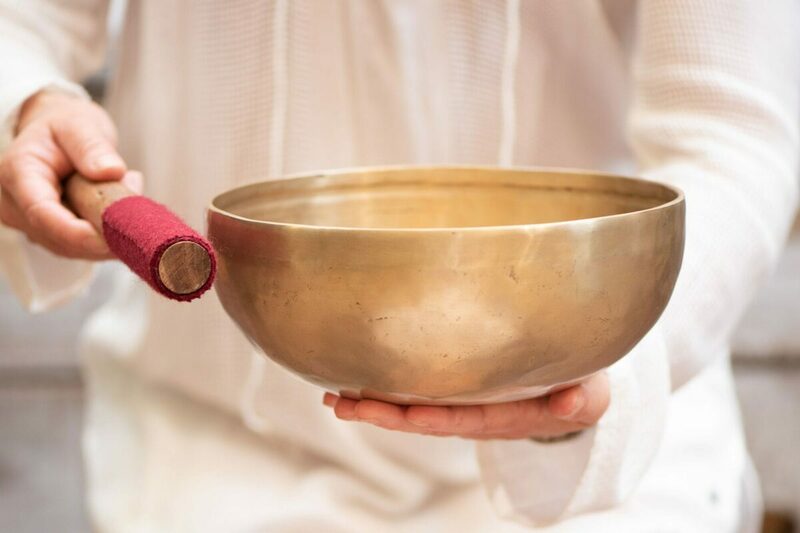 Utilizing instruments like singing bowls (crystal and brass), gongs, drums and chimes, sound healing works to release stress associated with anxiety and trauma, deepening breath and slowing brain waves to a calm and meditative state. By the use of frequency, vibration and intention, sound healing both creates an environment for change to occur, while simultaneously serving as a catalyst to initiate change on a molecular level. Like yoga, sound can move individuals from a sympathetic nervous system response, to a parasympathetic nervous system response, allowing them to experience heightened levels of relaxation, meditation and harmony. When combined, yoga and sound healing are the perfect complement to encourage a private and collective experience of mindful living. At the physical level, these modalities reinforce a healthy lifestyle of diaphragmatic breath, stress reduction, immune support and muscle movement/flexibility. On the mental plane, they bolster clarity of thought, focus, intuition and creativity. At the emotional layer, they stimulate healthy ego development, existential meaning, non-attachment and altruism. Together, yoga and sound healing, offer a sonic-infused growth toward well-being. The art of healing is as beautifully complex as the human beings in need of care. Developing a palette of modalities that honor and reflect that complexion is a worthwhile endeavor. Understanding and implementing the ancient science of yoga and sound healing can address the needs of modern-day ills, respecting the integrative integrity of those being healed.